Enjoy this short highlight reel of my work and get more details below. Primary developer on AR experience that really pushes the boundaries of what’s possible with current technology. The Purge AR uses horizontal and vertical plane tracking, allows you to place and adjust objects throughout your environment, and even has a multiplayer version on iOS using the new shared AR capabilities of ARKit 2.0. For this cross-platform, online multiplayer, augmented reality game, my focus was on elements like the character creation system, and much of the user interface. Created a localization system used throughout the game and assisted with online multiplayer refinement. 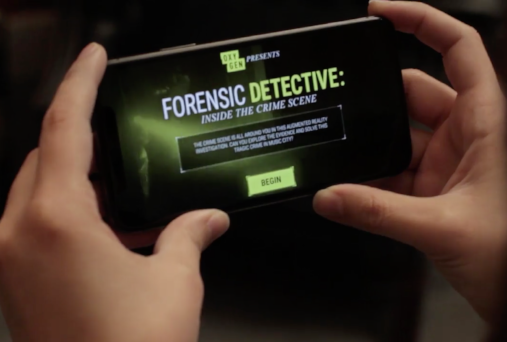 Was the sole developer on an augmented reality crime scene investigation game, Forensic Detective. This project was completed for a major television network and has received significant accolades from sites like POPSUGAR.COM. Updated an existing game for iOS to work with 64-bit iOS and port it to Android phones. Added in several new features and improved performance and appearance for modern phones. Game development and programming for a suite of electronic pull-tab games to be distributed in regulated markets like Kentucky and Minnesota. These games were developed in Unity and interface with POS and results databases. Created and improved UI for inventory, character status, quest logs, and other features for an unreleased adventure game. Additionally assisted with HUD elements for combat encounters. Some bits of the life of George Fan, creator of Plants vs. Zombies, are liberally recreated in George Fan: The Game. George Fan said of the game: "This is beyond amazing." Created as a completely silly entry for Wizard Jam 7, George Fan is a short, first-person exploration game that should be experienced along with its accompanying episode of the Designer Notes podcast. Ping was created as an exploration of sonar-based combat with diagetic UI and intended to be a challenging experience. Created during the two-week long Wizard Jam 6 game jam. The world's first puzzle-shooter, "Suddenly, the King of France!" places players in the unenviable position of saving their royal neck by dressing up oncoming revolutionaries in royal garb. Blast the ungrateful hordes with your regalia cannon before they tear you from your lofty perch! Created during the Wizard Jam 5 game jam. Relive those endless days spent exploring outside, collecting bugs and treasures, all while avoiding your grouchy neighbor. Moby features environmental stories, minigames, and more. Originally started as a game for the GBJam, Moby is currently being expanded to a full release with a huge world to explore and plenty to find. It is expected to release in 2018. In an anti-human future, Cool Blob must fill structural gaps to assist an endless charge of quadruped robots as they push humans to their demise. Cool Blob Future has a 16-bit aesthetic and gameplay reminiscent of classic LCD games like the Game & Watch. Hopefully its humorous tone will help you discover an alternate ending -- something pretty uncommon in an arcade game that's all about high scores. Cool Blob Future was created as part of the Wizard Jam 4 game jam. A finger-twisting sideways take on Breakout, your two characters are pitted against the Devil himself as he builds a giant tower of mushrooms you must destroy. The physics and title screen on this one are pretty rough, but some elements -- the sound design, the weird palette, and the randomly generated mushroom tower -- were satisfying to create and to see in action. Created as part of the Wizard Jam 2 game jam. Frothy Bird combines the color-changing mechanics of Ikaruga with the addictive tapping controls of that other bird game. There are fifty distinct and increasingly challenging levels to blast through on your way to the final sequence that is the ultimate test! Frothy Bird was previously on sale for iOS and all Windows platforms.